Who was allowed in the temple in Jesus' day? Q: When Jesus was teaching and preaching in the temple, who was allowed in the temple? A: In Bible times, participation in the temple was restricted to those who were members of an elite group which generally included only descendants of the house of Israel and specifically (at the time of Jesus) the Jews. The outlying grounds of the temple (court of Gentiles - #12 in the map below) welcomed anyone. This is where Jesus reprimanded the money changers. The oft-used Bible phrase, "in the temple" refers to the grounds and courtyards of the temple as well as the temple proper and does not necessarily indicate that the event took place inside the building itself. For example, in Matthew 21:12 it states, "And Jesus went into the temple of God, and cast out all them that sold and bought in the temple, and overthrew the tables of the moneychangers, and the seats of them that sold doves." We know that the money changers were located in the court of gentiles, in the outer grounds of the temple. When Mary and Joseph found the twelve-year-old Jesus, "in the temple, sitting in the midst of the doctors" it does not necessarily mean that he was inside the building. Most likely, He was in the Court of Women (#9 on map to the left) where most of the teaching and gospel conversation took place. The Court of Women was a walled courtyard immediately in front of the temple and was restricted to Jews only. This was the location of most of Jesus’ temple teaching. 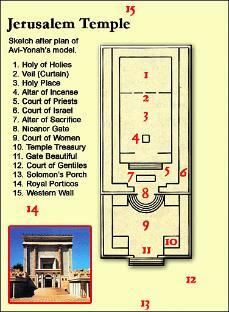 Other areas of the temple were restricted to men only (Court of Israel - #6) or priests only (Court of Priests #5). Entrance to the building itself, was very restrictive and the holiest place (Holy of Holies - #1) was only to be entered once a year by a priest on the Day of Atonement. Strict penalties were in place such that any who was deemed unworthy (a Gentile, etc) who tried to enter the temple would be immediately put to death. (See Ezekiel chapters 40-46, especially Ezekiel 44:10-11, also Acts 21:27-31) It was in these restricted areas (the Court of Priests and the temple building itself) that the sacred temple ceremonies were performed. Shortly after the Church of Jesus Christ was restored in the latter days, the members were commanded by the Lord to build a temple where additional priesthood keys and instructions could be received. More temples followed as church members moved and were driven from place to place. 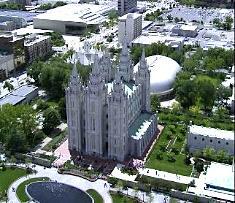 The Salt Lake Temple (the most well-known temple of the church) is one of nearly 150 sacred temples that now dot the earth. Like the temple of Jesus’ day, temples today have sacred grounds and courtyards which are open to all who will be respectful and reverent. Entrance to the sacred temple itself is restricted to those who have prepared themselves through baptism, and a demonstration of righteous living and maturity. The temple is open to all who will thus prepare and qualify themselves for entrance. I have grown to love the temple. If there is one near your home, I recommend that you visit the grounds and feel the sacred peace which prevails there. Thanks again for your questions. If you have further questions, please feel free to send them in. In the mean time, please visit Mormon.org for further information about the beliefs of members of the Church of Jesus Christ of Latter-day Saints.